While publicity materials such as pressbooks (also referred to as presskits) are useful tools in writing about films, finding a digital copy online might be a challenge, depending upon the movie written about and the popularity of press materials for the film in question. Some film archives will have a portion of their collections digitalized and easily accessible online like the William K. Everson Archive at NYU, while others may require an in-person visit, such as the film archives at UCLA. Long regarded as the most important marketing tool for a newly released movie, pressbooks are not only valuable as historical film memorabilia, but can be very useful for a number of research and writing projects. For example, a pressbook can be used as a quotable source in a film review, or in an article evaluating how a star was marketed for a particular film. 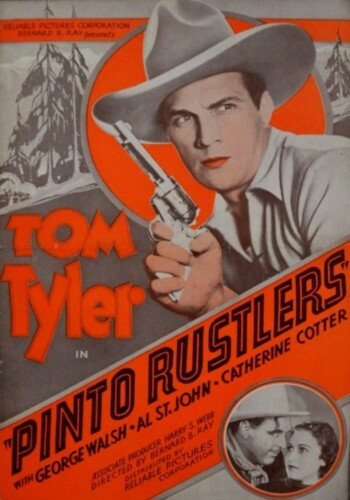 In the eight-page pressbook for “The Forty Niners”(1932), the star is marketed to the hilt when it comes to being described as “a virile trooper” being able to “love with that intensity and gentleness which is so devastating to women.” With descriptions like these, it would not at all be difficult to compose an attention-holding article based on information found in a pressbook. In addition to textual marketing, a variety of posters, taglines, credits, synopses, even burgees (flags) and creative ideas for movie theatres to hold during the premier showing of the movie were available as part of the marketing package. performs heroic feats of riding and fighting in “Ridin’ Thru,” his latest horse opera. Even the simplest of taglines such as this one can inject a stimulating interest in a film, simply by reading about it, then actually wanting to see it. With the abundance of material in pressbooks, many ideas for writing about film can blossom forth, and as usual, be recycled for future projects.